Given that there were a TON of kombucha questions on the post “Flavoring Kombucha and Kombucha Testimonials“, I thought it was time to put all the replies into some sort of order and do an updated listing some of my latest flavor combinations. If you are just getting started with Kombucha, please visit my post on “How to Brew Kombucha“. This post also lists some of the health benefits of kombucha. If you would like a more detailed explanation of the microflora and microfauna found in kombucha, along with a comparison of kombucha and water kefir, check out this post. Q: Where would I obtain a scoby? I recommend Kombucha Kamp for kombucha scobys and brewing equipment. You may also be able to find someone near you who is willing to give you one. You can also grow your own from commercial kombucha. Here's a video showing how to grow your own scoby. Q: How do you store the scoby? What if I want to stop for a while, can the scoby be stored until I want to start again? You can store a scoby indefinitely in a glass container at room temperature. Keep the scoby covered in kombucha liquid. Keep the container covered to keep bugs out. Originally I kept my scoby in the fridge, but this is not necessary. The natural acidity of the liquid helps to preserve the beasties in the scoby. Q: Should I cover my kombucha? I cover my kombucha with a clean flour sack towel secured with a rubber band (fruit flies love kombucha). During the second ferment, I place it in a sealed jar or bottle. Q: Where do you get your (bail top/flip top) bottles? The bottles I prefer to use are EZ-Cap 16 ounce clear bail top bottles. Most brewing supply stores should have a similar product available. You can also order a case of them from amazon. Q: Can you use a standard beer/soda bottle and capper? What about screw top bottles? You can use any bottle that seals well. The only inconvenience of a standard beer bottle would be that it does not reseal easily if you don't wish to consume the entire bottle in one sitting. Please be aware that a well sealed bottle may build up quite a bit of pressure, especially in warm weather. I have heard about bottles exploding due to excess pressure. I have never had a bottle explode, but I have had the contents of a bottle fire out in a plume that spread over several square feet of my kitchen. The flip top bottles make it easier to bleed off pressure. Bottles with screw caps (such as carbonated water bottles or Mason jars) will also work, but may not hold the carbonation in as effectively. Q: What's the safest way to open a bottle that may be explosive? Thus far, the most effective technique for opening over-carbonated bottles is as follows. Place a wide mouth, fairly large vessel (I typically use my coffee mug) in a sink. DO NOT SHAKE OR MIX THE BOTTLE. Tip the bottle over so that the bottle opening is within the cup. Gently ease the bottle open a little bit at a time. You should be able to tell very quickly if you're going to have a “sprayer”, as bubbles will rise rapidly and violently within the bottle and try to escape the bottle. I will typically let the mug fill with foam once, close the bottle and let everything settle, and then repeat the process until I can safely open the bottle entirely without the contents spraying out. This situation is most likely to happen when a) Your bottle has been sealed a long time (several weeks or more), b) Your bottle has been stored in warm place, c) You used a large amount of fruit, juice or other sugary add-in, or d) any combination of the above. Q: Why doesn't my kombucha have any carbonation? In my experience, kombucha will become lightly carbonated even during the initial brewing when it is covered with a cloth or coffee filter, etc, due to the carbon dioxide given off by the fermenting cultures. The longer it sits, the more bubbly it becomes. A young brew (7-10 days) will be less bubbly than an older brew (14-21 days). Heat will also speed up the fermenting process (but don't get things too warm, 23°-30°C (or 70°-86°F) is preferred). Putting your scoby in hot tea can kill it. Placing your kombucha into a sealed jar with or without additional flavoring will trap the bubbles and increase the carbonation. Q: I tried store bought kombucha and the “vinegar” taste was too strong for me. Does kombucha always taste that strong? Brewing your own gives you much more control over the flavor. I do not care for unflavored kombucha. A younger brew (fermented only 7-10 days) will have a much milder flavor. Cooler temps will produce a milder brew as well. Increasing the amount of fruit or fruit juice will also mellow out the flavor. My friend MJ did not care for the more acidic blends, but found the 1/2 cup of mango juice per bottle to be quite good and also liked a strong ginger flavor with plenty of carbonation. Another probiotic option you may wish to consider is kefir soda. I make a kefir raspberry lemonade that even the boys will drink. The problem I've found with the kefir is that the longer you let it ferment, the more carbonation you get, but it ends up tasting more winey and less fruity. They generally drink it young with just a little bit of bubble. Q: When do I flavor to my kombucha? You normally add flavors during the second ferment, but could experiment with adding them during the first ferment as long as you keep an unadulterated scoby in reserve. This post on flavoring kombucha describes how I flavor my kombucha and several flavor variations I've tried. Q: If you add fresh fruit juice or fruit to the kombucha do you have to keep the bottle refrigerated or will the kombucha help preserve the juice/fruit? Because the fruit and fruit juice contains sugars, and the kombucha is acidic as well as biologically active, the fruit juice is “preserved” by the kombucha. That doesn't mean that it will still taste exactly the same. 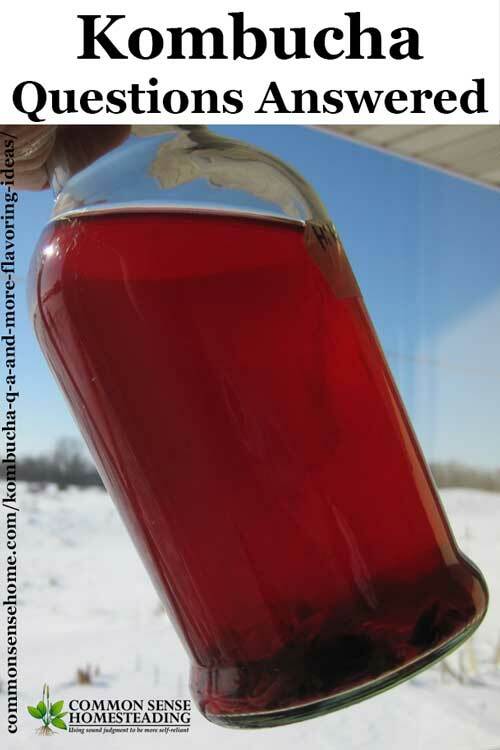 The kombucha culture will start eating the sugars in the fruit, just as it eats the sugars in the original brew. I typically leave mine on the counter (after adding the fruit or juice) for around 24 hours, to give the brew more carbonation, and then refrigerate, which slows down the fermentation. I prefer 1/2 cup or less of juice/fruit per bottle, just to mix things up a little, but friends who are new to kombucha tend to prefer fruitier blends. 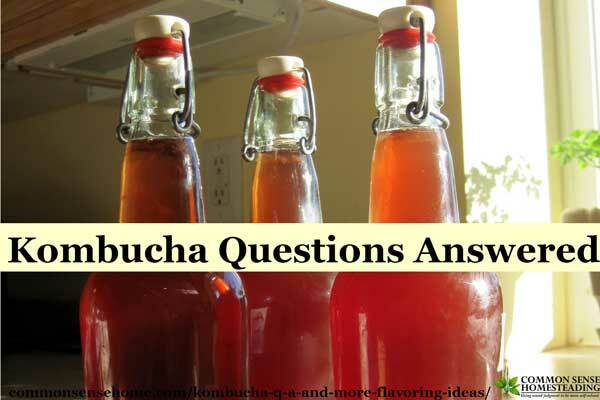 Q: Do you eat the fruit chunks that you used to flavor the kombucha? Can you eat a scoby? I eat the fruit. Blueberries are my favorite fruit, as they tend to “pop” in your mouth because of the carbonation. I've been known to slurp down a baby SCOBY, too (a small one that has formed in a bottle neck). I think they taste kind of like oysters. Bigger scobys are really tough. Some people have been experimenting with drying them and using the kombucha culture “leather” to make clothing, but so far the clothing is not moisture resistant, so you can't sweat or get caught in a shower or it will fall apart. Q: Have you tried flavoring with herbs or essential oils? Q: Any other kombucha flavoring ideas? Any more kombucha questions or flavoring ideas? I'll do my best to answer if I can, just drop me a note. You may also want to check out the posts below. Water Kefir Versus Kombucha – What's the difference between water kefir and kombucha? Originally posted in 2011, updated in 2017. Awesome tips! I have a batch of black currant kombucha brewing now. It tastes like currant wine, oh so good! I watched a video on YouTube where you can flavor the kombucha with different flavored teas. After the brew with 4 black tea bags add 2 bags of a flavored tea you like. I have 2 different kinds going right now, lemon ginger and moroccan mint. Any suggestion for a root beer type flavor? How about using hibiscus tea bags for the initial brew? I'm new to kombucha brewing and just looking for ideas. I've also had an aloe flavor one. I didn't really taste that much different, but Id like to try making it. Common root beer herbs include sassafras, sarsaparilla, wintergreen, vanilla and licorice root. I hope to be making homemade root beer soon with a friend, so perhaps I can experiment with root beer kombucha at the same time. Does your hibiscus tea contain actual tea along with the hibiscus? If so, I'm sure it would work. If not, you may want to try part herbal tea and part regular tea in your brew. If you are looking for flavoring ideas, did you see the earlier post: "Flavoring Kombucha and Kombucha Testimonials"? The link is in the article above. this is a ?, for the 2nd ferment , do you remove the scoby to start another batch, add your flavoring to the first batch and let it sit again , or leave the scoby in , add flavor and let sit again? I am confused on the order I guess, I have a batch i started the 1st process 2 days ago, am getting so many ideas for flavorings here, that prune one sounds great as do they all!! No scoby in second ferment. Brew sweet tea. Add scoby and some liquid from previous batch. Let sit. Remove scoby and reserve with some liquid to start next batch. Bottle finished kombucha (without scoby). During bottling, add flavors, if desired. I happen to have some prune juice in the fridge, I would not have thought of that!! My favorite so far has been blueberry-pineapple, but I am about to embark on a journey into new territory today. It took me a long time to figure out that each new flavor should be just ONE bottle, not the entire batch. (Smh). I’m a slow learner. Love your website, by the way. These are great descriptions. Do the prunes have the same laxative effect if used in second ferment? I have not found them to have a strong laxative effect, but they may cause some gas. 1) Can I cut my SCOBY in half and use in 2 jars the same size as used to grow the original SCOBY? or do they need to be the full size of the jar to be safe? Cutting the scoby in half should be fine. Just make sure that each batch is given an ample amount with liquid from the previous batch. I have successfully used both alcohol and oil based flavorings in the second ferment. What I wouldn’t recommend for flavoring would be essential oils. (I know some people use them in cooking.) Many essential oils have antibacterial/antimicrobial properties that could kill some of the microbes in the brew. What kind of alcohol can be used? Wouldn’t anything with high alcohol content kill the SCOBY? Could you tell me a bit more about the oil process? how long and what temperature do you use for the second ferment? I don’t use coconut oil in the ferment, only oil based coconut flavoring. Similarly, the only alcohol I use is very tiny amounts of alcohol based flavoring, i.e., extracts. In minute quantities (a few drops), the alcohol content is not an issue. I’m new to kombucha, but can’t help to experiment. I put a drop of ginger and a drop of fennel into the second ferment and drank it after 1 day. Delicious. DoTerra oils used. I don’t recommend ingesting essential oils (Yes, I know it’s commonly recommended by doTERRA. I was part of their organization for a time and this is one of the many reasons I left.) Essential oils are extremely concentrated, and can disrupt your inner microflora and kill the probiotics in your kombucha. Have you any advice using liquorice root tea instead of green tea? Give that licorice root has natural antibacterial properties, I don’t believe it would be a good choice for keeping the kombucha culture happy. I would like my kombucha to tast more like the store-bought ones. So I’m wondering if fruit extract can be used to flavor it, such as cherry extract? I does contain alcohol, so I’m not sure how that will affect the microbes. Thank you. Small amounts of extracts (a drop or two per bottle) should not be a problem. Hi, Laurie! 🙂 I’m a total newbie to kombucha fermenting and I love and appreciate all your kombucha information. I am wondering, do you think organic fruit preserves would be good for flavoring? Thanks so much!! Other than being a little messy to work with, I don’t see a problem. You’d probably want to try those in containers with wider mouths for cleaning, in case the preserves want to stick to the bottom of the container. Love all your tips and ideas regarding Kombucha! Thank you so much! what about nuts…has anyone tried? I am thinking almonds or hazelnuts…although nuts are kind of expensive so I would want to eat them after…I wonder what kombucha nuts would taste like if you dehydrated them?! I think nut extract would work much better than the nuts themselves. I don’t recommend the use of essential oils internally because they can kill good bacteria along with the bad – as your friend found out with her dead scoby. There’s also some disagreement about whether or not it’s a good thing to use kombucha with candida, as some strains of kombucha contain Candida albicans. Typically there are enough other microbes that is stays in balance, but when there’s already a candida overgrowth – it’s helpful for some but not for others. For more on my experience with candida, see https://commonsensehome.com/home-remedies/#Beating_Candida_and_Psoriasis. Hi I made my first batch of kombucha with a scoby from my friend. I didn’t realize that the flavouring works best I the 2nd fermentation. I added a couple lemon slices in my sweet tea but squeezed them and removed them before putting them in with my scoby. Is the kombucha safe to go for 7-12 days or should I refrigerate it after 24 hours. Thanks in advance for your advice. I wish I had found this page before I started! hmmm… I have not done this, but lemon is acidic, and you took out the chunks, so I would think it should be okay. With kombucha, you really need several days of fermentation for the scoby to do its thing. 24 hours isn’t enough. Keep an eye on it and watch for any signs of spoilage. If it goes “off”, you should see mold or similar. It’s possible the acidity of the lemon might inhibit the growth of the scoby, but I’m not sure. It makes its own acid, but coffee (used to make coffee kombucha) weakens the scoby. Hi Laurie! Are there any fruits or vegetables that you would NOT recommend? Admittedly, I’m not as experimental as some of the comments in this thread, but in terms of the ‘standard’ fruit selection, are all fruits ok to use? Peaches, lemons, mint, watermelon, etc.? I don’t think melon would work very well because of its high water content. It seems like the flavors would become very washed out. Not sure I’d be into the mint, either, just because of the flavor profile, but it would be safe. Lemon would likely be fine, since people use lemon in tea, although with kombucha you’d be adding acid on top of an already acidic drink. Whatever you decide to use, keep in mind that the flavor will be diluted, so it’s best to start with fairly intense flavors (like dehydrated fruit). You should also choose fruits that blend well with a tart acidic drink. Lemon and lime might be a little too much, but pineapple works even though it is acidic because it is also sweet. Can you add a combination of concentrated juices with non-concentrated juices? You can add whatever you like. It’s fine to mix and match flavors and see how you like the results. Hi, Laurie! I’m having problem with my second fermentation. No matter what kind of fruit juice I added in – strawberry, blueberry, apple or anything, after second fermentation, it always tastes like rotten fruit, and not fizzy either. I don’t care about fizzy that much but the rotten taste kind make me worried about the health value. I add several tablespoons of fresh fruit juice in a bottle and no extra sugar. I wonder is that because I didn’t add sugar or something wrong with my scoby? I wonder if your scoby is off. I brewed for years with good results, then took a break for a while during the time I was dealing with skin issues. I recently got a scoby from a friend and started brewing again, but I noticed right away that the scoby didn’t behave the same way my old one did. When I bottled the first batch at one week, it was flat and much sweeter than my old brew. When I attempted a two week brew, it grew mold instead. If you have rotten flavor instead of fermented flavor, I think you have a dud scoby, too. It can happen with wild ferments. Something gets in that throws the mix off. That’s why commercial brewers rely on specific yeast strains, sulfates to kill off wild yeasts, and closed containers. I like using wild ferments because of their natural variation, but sometimes you get a batch that doesn’t work out quite right. Thanks, Laurie. I suspect the same thing. Some wild bacteria or yeast must have creeped in my scoby. Maybe I let it sit for too long during the winter. But unlike yours, the first fermentation taste nothing wrong. Rotten taste only comes out after I add juice in. So should I toss it all off and get a new batch? I’d be tempted to start with a new scoby. That’s my plan since mine when completely off. Oh – and with rotting instead of fermenting, it’s probably not acidic enough, which could make the brew potentially dangerous.